I hope everyone is have a great day enjoying family and friends. We are off to spend the day at the Ranch with the Remington Man's family. Can't wait. 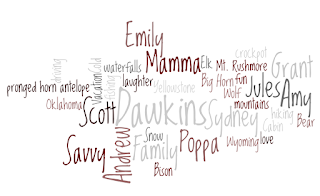 I thought in honor of the day I would create this Wordle to represent the vacation we all took together as a family this summer. I found this project here by Creative Holiday Gifts. Her tutorial is great and it is really easy to do; go try it out!